You will drop a bowl full of bloody meat onto your beige carpet. Even after meticulous cleanup, you will find blood droplets in unusual places. I have a window over my kitchen sink. Somehow blood from meal prep splattered on that. You will check out the meat department of every grocery store you go into. Just in case they are having a sale, or have some novel cut or protein that you your dogs HAVE to have. You will likely cut yourself. With a very sharp knife. While your hands are already covered in blood from cutting up raw meat. You will constantly be on the lookout for raw meat sources. Be it hunters, butchers, farmers, or retailers, you will attempt to find and befriend them all. That coworker you previously couldn't stand but recently found out is a hunter is now your new best friend. You have fed, or have been tempted to feed roadkill. Particularly if it's fresh. Don't judge me. Your dog's/dogs' grocery bill exceeds your own some months. Raw feeders, especially those feeding large or multiple dogs, know the importance of stocking up and buying in bulk. You don't wince at driving two hours one way to pick up 100+ pounds of meat. Especially if it's free or cheap. I drove 1.5 hours one way late last fall to pick up 375 pounds of fresh ground wild venison. Your dogs will try to thank you with a kiss immediately after eating their delicious dinner of green tripe. There is nothing more disgusting than green tripe. Except maybe spleen. You will find yourself investing in high quality kitchen gear. Who else has an expensive scale and expensive knives that they rarely use for themselves? Your dog will turn their nose up at something they should like. Like $12/lb organic rabbit meat, or duck leg quarters. You will find yourself using funny terms like "bony poop" and "other organ." 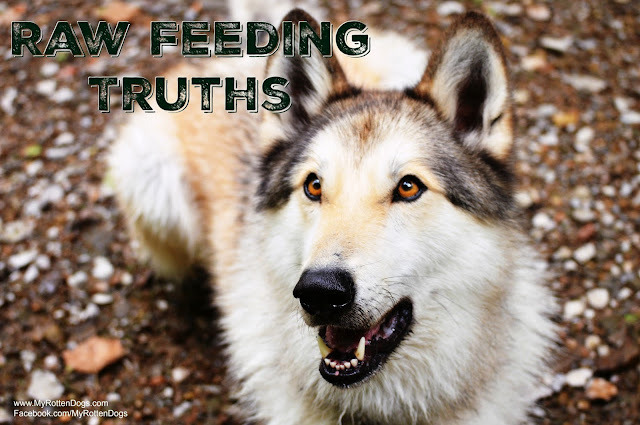 Click HERE for more info on raw feeding lingo. You will instantly bond with other raw feeders you meet, and compare sources, scores, proteins and results. The raw feeding tribe is good people. Your dogs will be more excited about meal times. You will recognize other raw fed dogs by the way they look, feel, and smell. My boys haven't been bathed in nearly four years. They don't have a smell (good or bad) at all, and petting them doesn't leave a greasy residue on your hands. You will flip out if you lose power. Suddenly the 400 pounds of raw meat in your freezer(s) becomes your most prized possession. You will purchase at least one freezer for the sole purpose of storing raw dog food. I have two dog food freezers. Good deals come in bulk. You may spend $300 one month for dog food, and nothing the next. Yay for bulk buying! You will find yourself visiting ethnic markets and meat shops that you otherwise would never have step foot in. Your dog might puke up some unrecognizable chunk of meat that it had eaten just three minutes prior. And then eat it again. Dogs are gross. You will find yourself convincing people that feeding raw doesn't cost any more money than feeding a high quality kibble. You silently squeal that moment that you realize your vet is raw-friendly, or a raw feeder themselves. And if they are not, you will likely set out to find one who is. You will get to the point that you no longer hesitate when someone asks you what you feed your dog. This last one is not a truth, but it should be. You never shame another dog owner because of what they choose to feed their dogs. Maybe they don't know any better than to feed the stuff that is $10 for a 50 lb bag. Maybe you can tell them about raw feeding, or affordable kibbles that are higher quality. Which of these hold true for you? Have any truths that I have not mentioned? OMD lol! I haven't ventured this far into raw feeding yet. I can only imagine but I did get a few laughs in. I instantly bond with raw feeders, I cringe when I see someone buying a bag of crappy food at Costco, and I'm trying not to convince all my friends to switch to raw. Trying. Love this so much. I still can't get over the fact that the people who previously lived in this home had 4 rooms carpeted with white shag like carpet. I don't know how in the hell they managed to keep it so clean, within months it had all sorts of crazy stains all over it..